We are in the middle of a communications revolution, expressed in a proliferation of media forms and media technologies. Are these changes a threat or a promise? Who is to control access to the media, old and new? What role should competition play in their further development? The United Kingdom is something of a global 'laboratory' for the deregulation and liberalization of media and communications. This is the first book to look systematically at the implications of the UK's experience and to provide clear guidelines for the future. Richard Collins and Cristina Murroni question orthodox views of both Left and Right concerning media and communication policies. Unlike many in the Left, they acknowledge the achievements of liberalism and in fact advocate an expansion of competition in some contexts. In contrast to the Right they argue that media and communications are too important to society to be left solely to the market - not least because markets often fail. Regulation is needed for effective competition, to ensure affordable access to essential services and to protect citizens and consumers. Collins's and Murroni's study was undertaken at the Institute for Public Policy Research - the UK's leading centre-left 'think tank'. Their findings are essential reading for policy-makers, students and professionals in the area of modern media and communications. Richard Collins is Professor of Media Studies at the Open University UK. Cristina Murroni is a consultant in media and communications economics and policy and lives in Italy. 1. Market Forces in Telecommunications. 2. Essential Facilities, Third Party Access and the Problems of Interconnection. 4. Universal Service Obligation in Broadcasting and Telecommunications. 6. Audiovisual Policies: Too Much or Not Enough?. 7. Public Service Broadcasting: a Better BBC. 8. Convergence and Change: Reforming the Regulators. 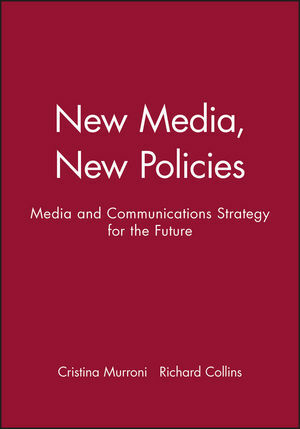 * The first systematic study of the consequences of new media technologies for questions of access and regulation. * Criticises orthodox views of the Left and Right about media and communication policies. * Develops a major new framework for policy makers with regard to the media in the UK and elsewhere.